12.5" RCOS @ ~f/9 (2880 mm fl) 0.64 arcsec / pixel. The Zoomify image scale is 0.85 to 3.59 arcsec / pixel. NGC 5905 and NGC 5808, in the constellation Draco, are beautiful examples of spiral galaxies seen from different angles. 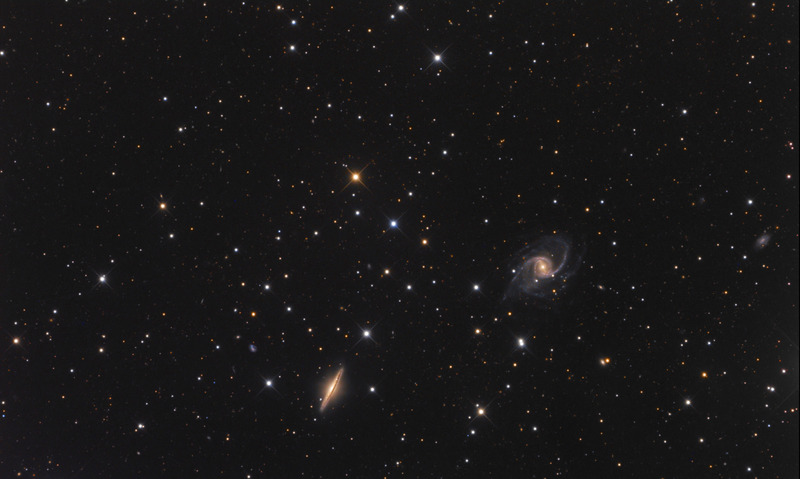 Their respective distances are 155 and 148 million light-years, with NGC 5905 at the upper-right. Although they are relatively close to each other, there is no interaction between them. NGC 5905 has a strong central bar and is a type SBb galaxy. It looks a similar our galaxy, The Milky Way, which is type SBc. Also in the image are about 2000 cataloged galaxies down to magnitude 22.5 with many more that are not cataloged and even fainter. There are eight QSO's, with the most distant having a redshift of z = 2.57. Finally there are seven faint galaxy clusters with redshifts of z = 0.41 to 0.56.